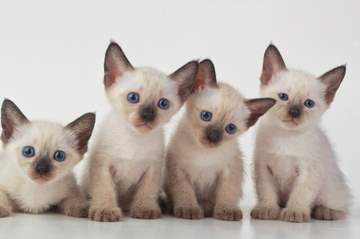 Facts about Siamese cats for beginners! Most of us would recognize this breed if we saw it. These cats all have brilliant blue eyes, a cream-colored coat, and points (the nose, ears, paws and tail) in one of any number of darker colors. These are the rather more obvious facts, but how much more do you really know? Below you'll find fifteen lesser-known Siamese cat facts, and learn how to care for your cats at the same time. In the Thai National Library in Bangkok there are manuscripts dating from the 1700s called the Cat Book Poems (Smud Khoi), containing illustrations of cats that look very similar to seal points. When Siamese cats were first shown in England in 1871 they were described as 'an unnatural nightmare kind of cat' because of their strange coloring. They went on to become one of the most popular cat breeds in the world! Their Thai name means 'moon diamond'. President Rutherford B. Hayes was given a seal point called Siam in 1879. Siam was the first ever 'ambassador' of the breed to the USA. Queen Elizabeth II was given a seal point kitten as a wedding present to celebrate her marriage to Prince Philip, Duke of Edinburgh. When females are in heat they will yell loudly and incessantly and their voices have been compared to an opera singer singing scales. They can sometimes be heard right down the street! It is quite possible to train a Siamese cat – due to their intelligent nature they even enjoy it. They can be trained to fetch and retrieve, walk on a harness, and even do tricks. These cats are prone to acne around their chins. This is because as they're eating, oily food flakes enter the skin pores just under the mouth. The pores get clogged, looking like blackheads, and if not kept clean can lead to the cat developing a bald patch. They are also prone to gum disease and tartar build-up on their teeth. Ask your veterinarian how to clean your cat's teeth. Dry food can also help. It's not really possible to own a Siamese cat, they're much too independent for that. Consider yourself lucky if one of them owns you! It's been said that Siamese cats are hypoallergenic but this isn't really true. They may however cause fewer allergy problems than other cats because of their short, fine fur. Always test this before adopting or buying a cat. Pregnancy: on average a 'queen' will be pregnant for 65 days, and some have had their kittens as late as 71 days. This is unusual, however - check with a vet at 68 days if the kittens haven't shown by then. Many Siamese (and other Oriental) cats are unable to digest lactose, a sugar found in milk and dairy products. Milk should not be given to them as it can go straight through them and cause bad diarrhea – experiment with caution! A seal point is genetically a black cat. The point pattern comes about from a mutation of the gene that gives cats their color. This mutated gene, which is color sensitive, restricts the amount of pigment showing in the coat except at the coldest areas of the body – the 'points'. A Siamese cat's eyes are blue because the gene responsible for the coat pattern also restricts the amount of pigment (which is responsible for green or brown eyes) in the eyes.